The last great trackbash? Well, that’s the current plan. I wanted to finish my Austrian track, which I’d already decided to restrict to ÖBB standard gauge passenger lines; also several items in the Czech Republic and Germany had come to light. Italy, Slovenia and Poland were all very short distance cross border ventures from Austria or Czech, and Hungary was just because the train I needed to use to do a curve in Austria didn’t stop until Hungary. So off I went armed with (on the basis that this was the last time) a 10 day Global Interrail, first class no less, with senior discount and a flight with a proper airline (Lufthansa).The moles seemed to be leaving me alone for once. Or so I thought. After their farce last night (2 car, wedged, filthy, 15 minutes late) ATW did much better and provided an on time, vaguely refurbished 4-car with a few empty seats on the stupid o’clock Aber to BHI, known to me as 07:51 from Telford. I even got the newish crossover to gain P1 at Birmingham Irrational. All calm at BHX, very quiet it being the Friday after the spring bank holiday. The Reverend James and I are currently awaiting The Call to gate whatever. Got The Call, left pretty well on time, slightly late at MUC. A real pleasure to travel with LH though a G&T would have been nice ... First part of the journey tainted by a loud Brummie roadie behind me regaling his neighbour with tawdry detail of his encounters with ladies of the night. I was truly amazed that nobody told him to shut up. MUC’s steps, bus and baggage all conspired to hold things up and I left on the S8 at 14:44 from a booked 13:50 arrival. Not a problem, though hardly auspicious. How right I was. A major tactical error at München Hbf when I dived on to ICE1602, it being the next ‘fast’ train to Nürnberg, only to find that it goes via Dachau, Ingolstadt and Treuchtlingen. It’s booked to arrive in Nürnberg at the same time as ICE1022 which leaves 45 minutes later, Hopefully no bones broken as it’s on time at Treuchtlingen despite no end of delay in moleworks around Ingolstadt. On time too at Nürnberg so plenty of time to get an Augustiner Helles from Yorma’s before the 17:48 IRE to Chemnitz. Timekeeping was impeccable as far as Marktredwitz, reached one minute early. The ride on tilt is fine but on plain track it’s pretty awful – whether that’s just this particular unit I wouldn’t know. Late leaving Marktredwitz and 5 late at Chemnitz mainly due to electrification moleworks. A walk down to the Mercure (my old haunt at the Günnewig Europa has been renamed An der Oper and is far too expensive – the Mercure had a no-cancel cheapo) then next door to Karl’s Brauhaus for a beer. Seasonal special was a hefeweizen – not exceptional but not bad, not expensive and definitely not filtered! A meal in a glass. Pub very quiet for 21:45 on a Friday. Very sunny, warm heading rapidly for hot. 8 hours’ Z hardly scratched the surface. Station breakfast (€4 vs €14 at the Mercure), and away on the poorly patronised 08:09 to Pockau-Lengefeld. Slightly concerned at destination Olbernhau-Grünthal in case it was an extension beyond Neuhausen but in fact it’s a cutback so I resorted to smugness instead. Nothing for it but to wait for the returning kart and slink back to Chemnitz, which I did. Consolation prize of a bottle of Hasseröde from the Point supermarket and off we go to Aue from weedy bay platform 16 in the separate bit of the station, à la Waverley excursion platforms. Some people will claim anything as track! Pleasant trundle to Aue in the sunshine with air con in good shape. Walked to the Blauer Engel, home of Lotter’s brewery. Excellent unfiltered Hell, very pale, yellow colour but much but much more body too it than the awful DDR pilsners. Trainee beer notes pseud at work here - beware! Priced at €2.70, comparable with Karl’s Brauhaus and indeed with the UK. Parish notices imply a) I’ll get to Potůčky but b) it might be a good old walk to the SEV stop. I suspect b) isn’t true, but let’s hope a) is or I could have gone round via Dresden in comfort. Kart’s arrived with Johanngeorgenstadt on the display but there again I don’t suppose they’ve got Potůčky so I’ll keep hoping. Surprises continued. 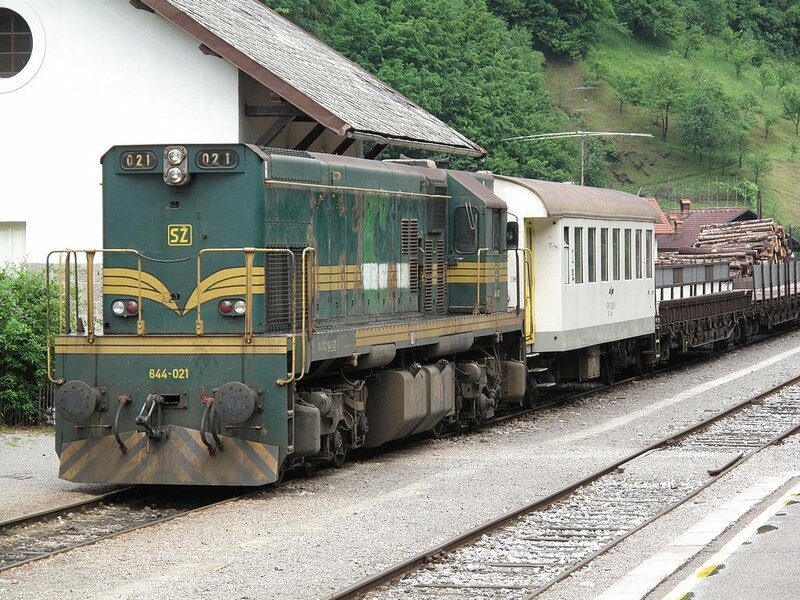 SEV was waiting at Potůčky as expected, and provided a highly scenic ride to Nejdek where an 814 was poised to go to KV. Parish notices implied some kind of connection to Chodov – asked the lady gripper and she pointed to the train. I decided to stick with the train anyway, not wanting to get stranded. On arrival at Nová Role a lot of pax departed – I stayed put and was rewarded with a right turn and a ride to Chodov thus doing this once-undoable line for the third time. Or maybe the fourth! The pub opposite Chodov provided a final (I assume) surprise. Various beers advertised outside including Černa Hora – this turned out only to be available in shandy form but there was an excellent Rychtař unfiltered, unpasteurised effort which was thoroughly enjoyed. Only diligent clock watching enabled me to catch R607 at 16:52. The pub was on some kind of guest beer circuit which included Rychtař and Černá Hora plus a number of others. According to the dates I should have missed the Rychtař – but who’s complaining? On to Praha for check-in at Prokopka (very definitely not improved) and a meet with PR at the Prague Beer Museum (excellent, touristy or not). Finally back to the hotel for much needed Zs. Rudimentary get-your-own breakfast at Prokopka which seems to be heading downhill. No need to be back, however, at least not at the time of writing. 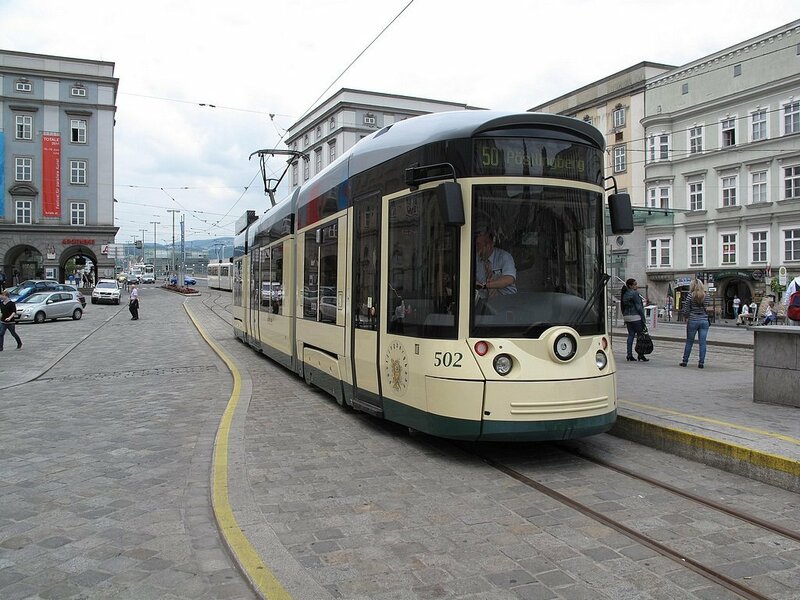 Tram to hlavní followed by a walk round the block in an unsuccessful search for an open potraviny. This did provide an opportunity to take up PR’s sensible suggestion and get my ticket at Masarykovo. There wasn’t a queue when I arrived, but when I left ... Beer supplies taken on at Pont for CZK17 the half litre (Krušovice) – also water which was more expensive than the beer, obviously. The usual nonsense about not giving out platform numbers but eventually we got to P6 north (confusingly referred to as 6s in Czech of course) to await an 843 with a couple of trailers forming 09:25 to Tanvald. Tanvald reached without incident, stopping (I think) a few metres further on than last time and providing overlap. 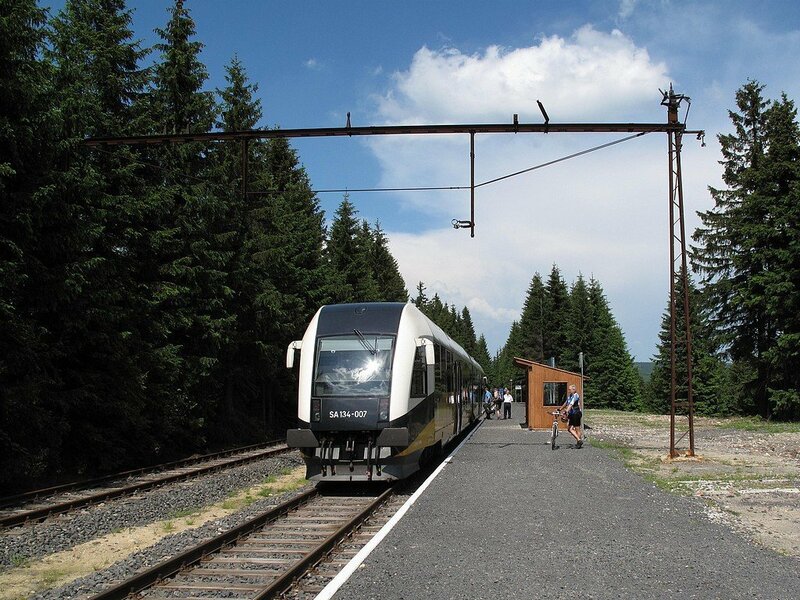 Thence on another DMU up the horrendous gradients to Harrachov. At Harrachov PR’s assertion that there was an operational buffet was tested and found to be absolutely correct; Krušovice and hranolky were taken, and a Svijany taken away for ‘Ron. Very smart Polish DMU appeared in due course, stopping well short and giving us overlap with the Czechs. Onwards to Jakuszyce where there was sufficient evidence to justify baling out for beer. 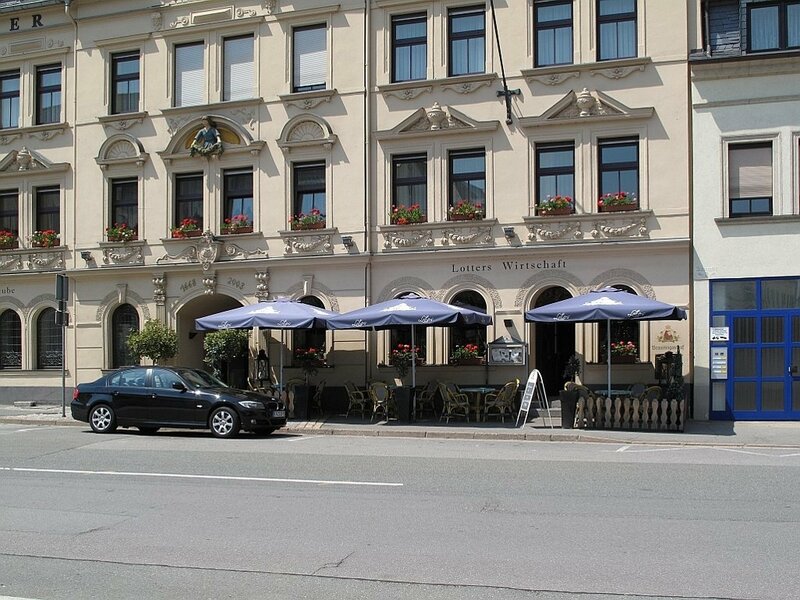 The effort was rewarded with draught Tyskie in a half-complete-smart-when-its-finished pub/hotel/restaurant. Big project – hope the investors’ faith is justified. Back to Harrachov on the returning Polish kart (SA134 007) and on to Tanvald for the 843 combo back to Praha. This was running about 6 late at Vysočany so plan A to bus it to Libeň was abandoned in favour of continuing to hlavní and getting a (brand new) City Heffalump to Hostivař where there was just time for a swift Gambo before joining 809 140 for the 19:56 to Libeň which did connections from Hostivař to the Malešice line and from that to the main line just east of Libeň. All good stuff. We rounded off the day with trams 3 and 10 to Palmovka and Bulovka respectively and a visit to the Richter pub for stew, dumplings and ležák. PKP's SA134 007 at Jakuszyce on the Szklarska Poręba - Harrachov service. The daylight's starting to go at Praha-Liben as light engine 742 136 passes 809 140 which has just arrived from Hostivař en route to Holešovice. A poor night for no apparent reason so down for breakfast early doors. Ada in the kitchen wasn’t ready so I started with a coffee while the rest materialised. Left the hotel (definitely going downhill, wouldn’t bother again) at 07:18 for tram 5 and Metro B to Anděl where PR’s tip-off had me heading in the right direction and I was on the platform at Praha-Smíchov Na Knížecí by 07:45. 810 334 arrived on time with a reasonable complement of passengers, followed by PR a few minutes later. It fortunately dawned on us that Jinonice was a request stop so I duly requested it! The NK branch is short (basically the length of a large goods yard) but definitely track. 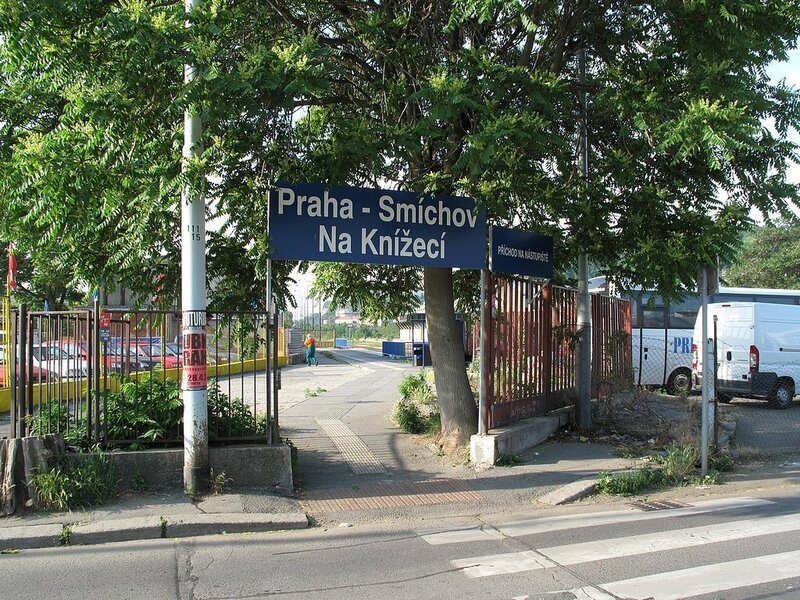 Slightly fooled by PR telling me we’d just charged through Jinonice non-stop but just as the re-planning started we stopped at Jinonice so I baled out hastily leaving PR to continue on his way to Hostivice and Lužná. Return for me was by a short, hot, uphill walk to Jinonice metro station then a longer, very hot line B to naměstí Republiky and a 26 tram to hlavní. EC273 Jaroslav Hašek turned up headed by Slovak 350 018 and with a nice air con open first section in half of the buffet car. 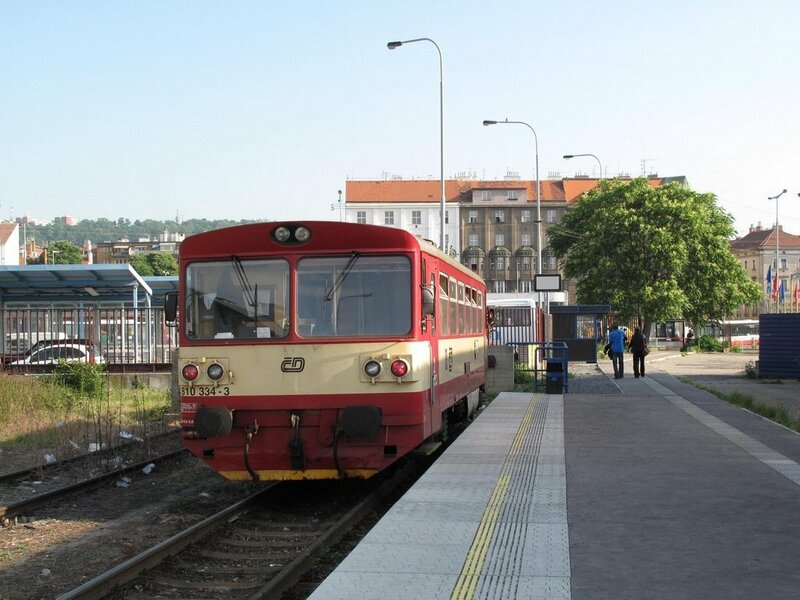 Delayed by 10 minutes at Kolín for no obvious reason, we were about 7 late at Ústí nad Orlicí but a stretch of SLW south of Česka Trebova has probably put us back to 10 down – and certainly delayed a northbound EC which was waiting for us. But I wronged them – just 2 late into Brno at 12:22. Retired to Pegas for ležák and stew, then to the Černá Hora cellar pub (dismal, but all the seats outside were taken) for a half litre of Páter which was very pleasant. Pity about the pub. Located the other Černá Hora establishment on the way back to the station – it appears to have closed down. 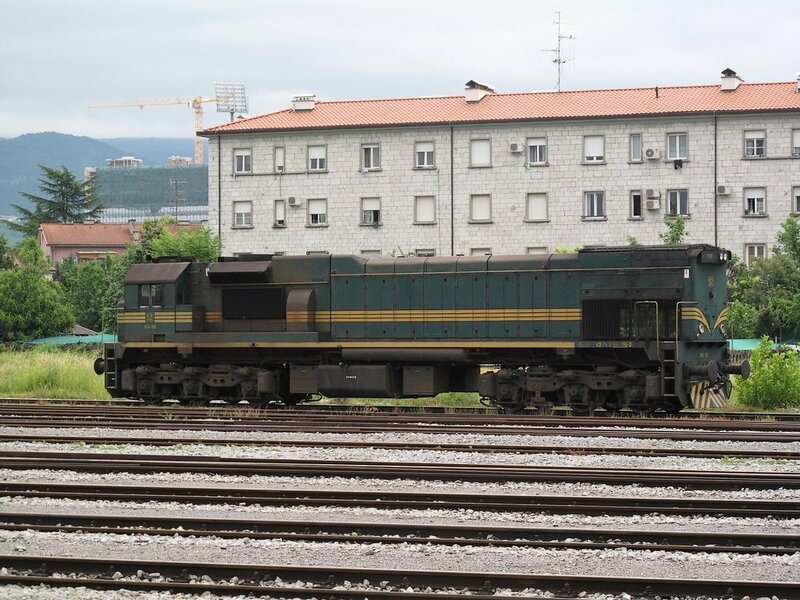 14:12 Os to Popovice then, with 242 228. Gripper perplexed by Interrail as usual but happy once he knew I was going to Popovice not Wien/Bucuresti/Roma/wherever. While waiting at Popovice 350 002 flew through on (presumably) late running 14:24 EC from Brno – Hungarian stock, Slovak loco. More mysteriously, 740 561 on northbound (sic) ÖBB empty stock. 14:57 Os duly turned up, sans passengers as far as I could see. Bert tried very politely to discourage me but as soon as I said I was going to Kralovo Pole all was well. Good for him, quite right and proper. Purists to note : trains stay on the main line past the yard north of Modřice, diverging R at the road overbridge south of Horní Heršpice and just before the flyover from the Jihlava line. 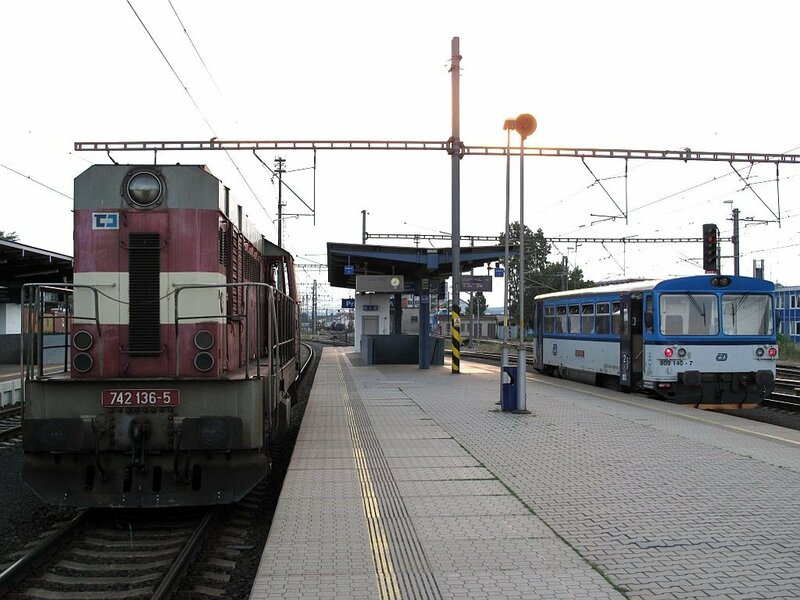 There is no connection with the Blažovice line at odb. Černovice, access is only towards the north at odb. Táborská. EC173 lifted the sadness by being dead on time and with a nearly empty DB open as the first coach. Haulage was a fly-bedecked ÖBB 1216 226. Unfortunately at the time of writing, 16:33, we’ve just come to a grinding halt at Modřice. Redcap has scampered across to the loco clutching papers – not looking perfect ... maximum permissible delay is about 40 minutes of which we’ve used about 6 so far. Local’s just arrived northbound and we’re under way at 16:39. We’ve not crossed over so presumably it’s bi-di on the southbound line. Long SLW section ending about km 125 – Taurus has now been let loose so we’ll see what it can do. By Czech standards, it’s going quite smartly. Into Břeclav about 8 late. Still here at 17:12, 10 late so far. ZSR’s 350 has cleared off to Brats and there’s a lot of shrugging going on outside. Whistle finally blown, ÖBB conductress is in and we’re away 11 late at 17:13. Ada is extremely efficient, if humourless and has gripped my journey diary. So in 13 days (10 last year) that’s two checks and one grip. As if that were not enough, as I’m walking off the platform at Simmering (10 late still, no panic) I’m collared by Herr Plod who wants to see my passport. What happened to Schengen? Anyway he was very pleasant about it and didn’t hold me up too long. And I wasn’t the only one, either. Down to the ticket hall to find numerous muppets unable to see that the ticket machines are multilingual, buying €1.80 tickets with credit cards, etc., etc. Eventually throw myself (and ticket) through the closing doors on a U3 and get to Westbf. with 10 minutes to spare for the 18:44 Salzburg. Result! Out to St Pölten pretty much on time, to await the inbound EZ from Passau. Amazingly, St Pölten’s rebuild is finally complete. Fairly prolonged skirmish with Mr Reisezentrum, who didn’t speak English, trying to reserve a seat on 04:45 ex Villach on Wednesday morning. After much debate over Tuesday and Wednesday in very, very halting German he finally came up with a screen which showed only kippers and couchettes. Badly though I want to do the line, a night’s kipper for 20 minutes isn’t a runner. I could do nothing but thank him and depart. Amongst St P’s new attractions is a very smart little supermarket. It sells Wall’s, sorry, Eskimo, but there were no Double Caramel or Gold, sadly. A very close second, however, was a wondrously cold can of Egger at €1.50. I settled for that – probably cheaper than the Magnum too! 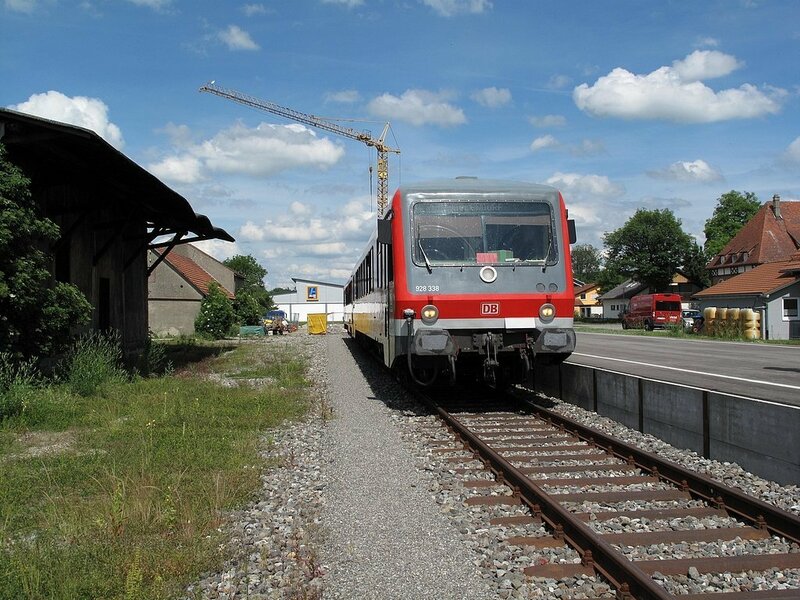 Serious business then, with EZ5927 to be done, filling in the Herzogenburg – Tulln gap. They’re still using the old stock with huge opening windows, hauled by a 1044, and it makes for a pleasant ride on a warm summer evening. The friendly gripper provided me with the timetable leaflet from which it appears that Einfach-Raus-Ticket is no longer valid. Whether that applies to all EZs requires further research. Unfortunately I missed part of the original route – the line now parallels the new Westbahn through the incomplete Regionalbf. Tullnerfeld, leaving the new alignment to rejoin the original just east thereof. I couldn’t see any trace of the old line at the eastern end, just the two new curves on to the high speed line, so it appears the stretch through Pixendof and Judenau-Sieghartskirchen is no longer with us. Soon after Tulln the light’s starting to fade so it only remains to make my way to Praterstern and the Etap. Which was done by decamping at Heiligenstadt for an S45 ‘round the corner’ to Handelskai low level and upstairs for an S9 to Praterstern. The station is scarcely more assuming. 810 334 has just arrived on the hourly service from Hostivice. 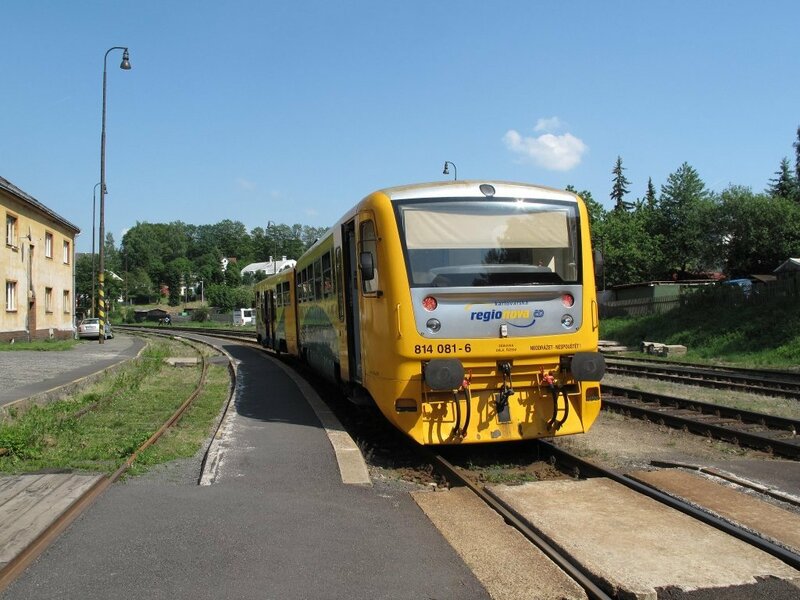 Goggle 754 018 at Brno hl.n. 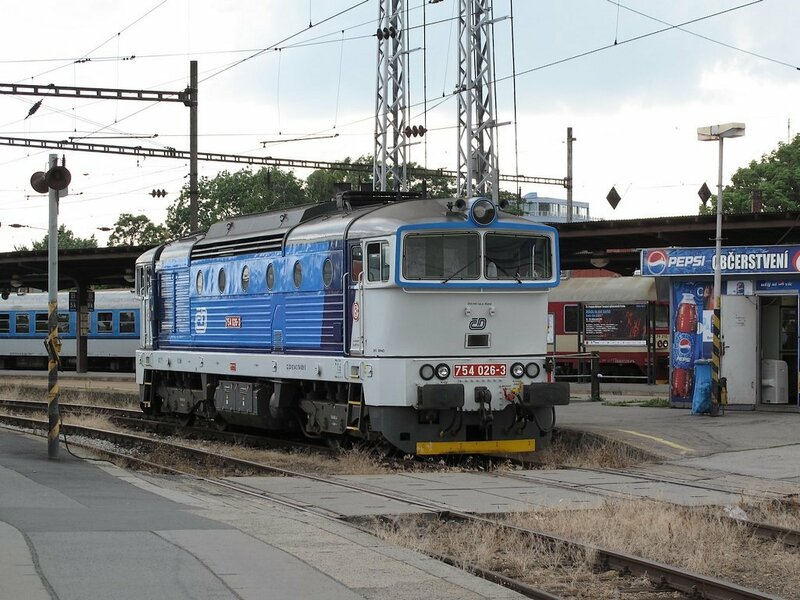 Blue liveried 754 026 at Brno hl.n. The Etap is new and blessed with air con and free Internet. What more could you want, [a decent breakfast, says a little voice in the distance]. All too short a night unfortunately with 06:00 departure (nearly made it, honest) required for R2209 at 06:27 to Leobersdorf. This was air conditioned Dostos so a comfortable ride was had, with a seat on the shady side too. There was time to grab breakfast at Leobersdorf but none to be grabbed. 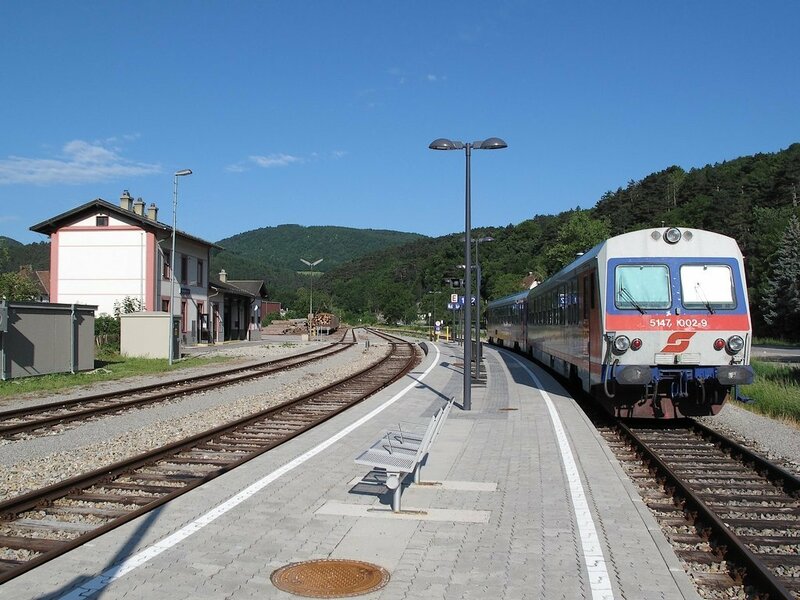 A two car DMU (5147 002) awaited for the half an hour or so up to Weissenbach-Neuhaus, and what a nice little branch it is too. Very good to look at on a sunny morning, attractive villages en route, and a magnificent preserved toilet block at St Veit an der Triesting! Weissenbach-Neuhaus isn’t all that appealing, having had the blue/grey/new platforms treatment. It’s got timber traffic though, and a notice saying that €19.1m was spent on infrastructure last year, kind of suggesting that it’s not an imminent closure candidate. On the way back I noticed the timing had us in P2, the ‘main line’ platform (though P1 is as well) so was duly at Physcon-1 as we approached the station. We did indeed end up in P2 – why, I’ve no idea as an ‘R’ northbound then used P1 – thus doing the main line connections (or indeed both, having left from P1). A S9 to Wiener Neustadt was showing on P3 at 08:56 so I nipped across to get that. The extra time was sufficient for breakfast at Wiener Neustadt Hbf. It cost half as much and unless Etap breakfasts have improved with the hotels, was twice as nice. Another superb branch up to Gutenstein, in an air con kart this time. On arrival there’s a freight there which explains the 1 hour gap but the timetable says 10:35 so I dive back in. Driver chucks me out, telling me one hour. I look again at the timetable - © (weekends). How many times have I done that? Still, no loss at all because just outside is Bella’s Café with parasols and Piestinger, brewed a few stations down the branch. Very enterprising, English spoken, sells Murauer too. So, of course, I had to try the Murauer (which if I’m honest, was much the nicer of the two). But why, oh why, don’t businesses realise how important a good ‘front man’ (or in this case ‘front woman’) is? And how valuable? [I’d be willing to bet that the young lady at Bella’s Café was worth an extra 10% on the turnover just by having such a cheerful and friendly attitude.] Meanwhile, back on the 11:35. Quite a well provided-for branch – Pernitz Muggendorf has Christi’s Café, also advertising Murauer. Plenty of freight too – on the way down we passed another 2016 with two bogie vans and two tankers. Reverting to the beer provision, there’s a Puntigamer establishment on the approach at Wöllersdorf (a.k.a. Wöllersdorf/Piesting) too. At Feuerwerksanstalt 2016 098 was waiting with a trainload of concrete beams from the adjacent factory. We can’t do this sort of thing at home, of course, because ...?? On time arrival at Wiener Neustadt, near enough, so no problem with the 10 minute connection on to 12:37 to Puchberg am Schneeberg, whose 5022 was already waiting. It’s a very different branch from Gutenstein, taking longer to get out of the flat lands and when it does, making its way up a much wider valley. However as it gets towards the end it becomes a fearsome climb – to the inexpert eye at least as steep as Harrachov – but then goes surprisingly (and steeply) downhill to the last two stations. The appearance and livery of the Schneebergbahn train made me quite glad I’d decided not to do it – though it was the £30 return fare that had prompted the decision. I’d imagine it’s a spectacular ride though. There is (natürlich) a bar on the station but neither time nor inclination was there – and they hadn’t got any Magnums either! Back at Wiener Neustadt Hbf I decided on one last desperate attempt at booking a seat from Villach to Tarvisio. Off to the Reisezentrum, where Ms Monika Müller was immediately able to deliver the goods. In fact I can go to Venice if I wish (I don’t). Celebration was clearly in order, and a Magnum Gold was the choice. 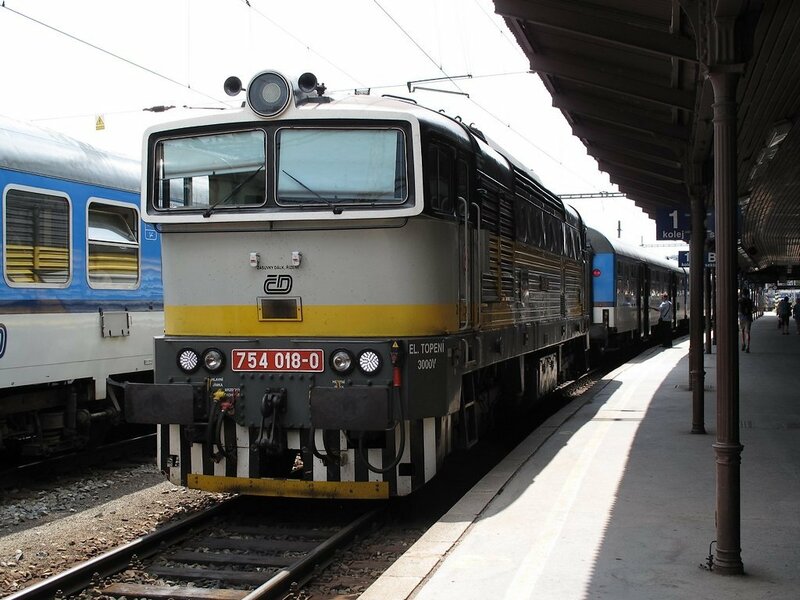 EC103 proved to be Warszawa-Villach, with Polish stock hauled by 1116 132. The bad news was the wretched compartment stock but the good news was the WARS restaurant car enabling me to get an enjoyable meal and a (slightly less enjoyable) Tyskie and unload some surplus zlotys, all at reasonable cost by German/Austrian standards. Serious rain at intervals before Villach but only drizzle there and I had a brolly so didn’t get wet getting to the admirable Hotel Post. The receptionist offered a packed breakfast when I explained I was leaving at 04:00 and after a quick check on the news on the Internet I was in bed by 19:30. 5147 002 has its blinds down at Weissenbach-Neuhaus in an attempt to keep the cab cool during its short layover. 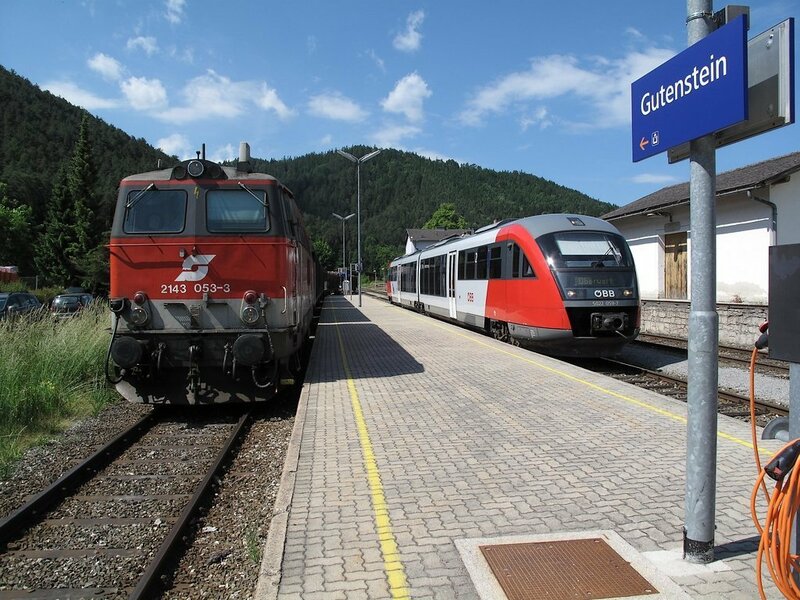 The hour gap in the timetable at Gutenstein allows time for the local freight, headed this day by 2143 053, to get down the branch. Don’t like early starts any more ... especially after being woken several times by rowdy locals. Alarm at 03:30, out just after 4 with copious breakfast ready and waiting in a carrier bag. Noise notwithstanding, I can’t speak too highly of Hotel Post. EN237 was the usual shambles of stretched out bodies, including the ones in my seat. I was happier standing though, so that I could see out, and I left them to it in favour of the ‘observation car’ view from the rear vestibule of the last coach. Daylight was appearing when we left Villach and was well established by Arnoldstein where new track started. Honour was therefore satisfied and we rolled into Tarvisio Boscoverde on time at 05:08. 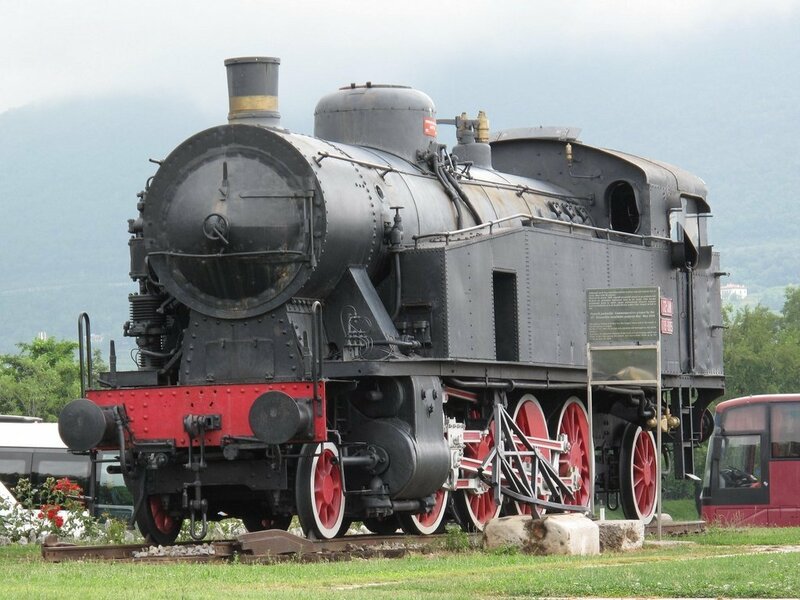 The practice seems to be for Austrian locos to coast into T-Boscoverde and then be removed by gronk and propelled to the Austrian end of the station. This was done with the locos off my train and a RoLa which appeared later. Off to Udine on the stopper at 06:06. The line seems to be mostly tunnel as far as Carnia, only emerging for a quick charge across a valley and/or a station stop. Thereafter it’s a wide valley, one tunnel and eventually a plain. Udine was bustling – as there was a slightly quicker (than my intended 07:45) train to Gorizia I chose that and was rewarded by fairly scruffy first class for the half hour journey. If Udine was bustling, Gorizia was bedlam with every schoolchild and every school bus in the province outside the station, or so it seemed. I left them all to disperse while I visited the free and immaculate (nay, palatial) ‘facilities’, then got my €1.05 ticket from the machine and set off to Nova Gorica on the bus. It’s an odd little 10-seater though it claimed to take 40 standing. Rock hard plastic seats too. Nova Gorica duly scoped, and not wishing to spend 2½ hours in the station buffet, I decided on sightseeing. After finding out that you can get bus tickets from tobacconists I got two and went into town, noticing a large contingent of police/carabinieri and even army around the square below the castle. The castle looked a good bet so I baled out at the next stop and staggered up the hill, quite an interesting walk in itself though strenuous. I’d decided on getting a bus about 10:00/10:10 (they’re every 10 minutes). Arriving at the castle at 09:30 I found it doesn’t open until 10 so I photted and retired. Back down in the town, much larger police/army presence so I enquired. A parade for Afghanistan/Iran returnees apparently. By this time it was bedlam, traffic gridlocked, police and army everywhere, no sign of any buses. After 15 minutes wait still no sign so as it was after 10:00 I decided to walk. Back at the square I found a helpful traffic cop who gave me directions – he didn’t speak English but I remembered some bits of the route and we got by. It was about 15 minutes walk from there so in the end I still had time for a Laško (quite a nice malty brew) while I cooled down. 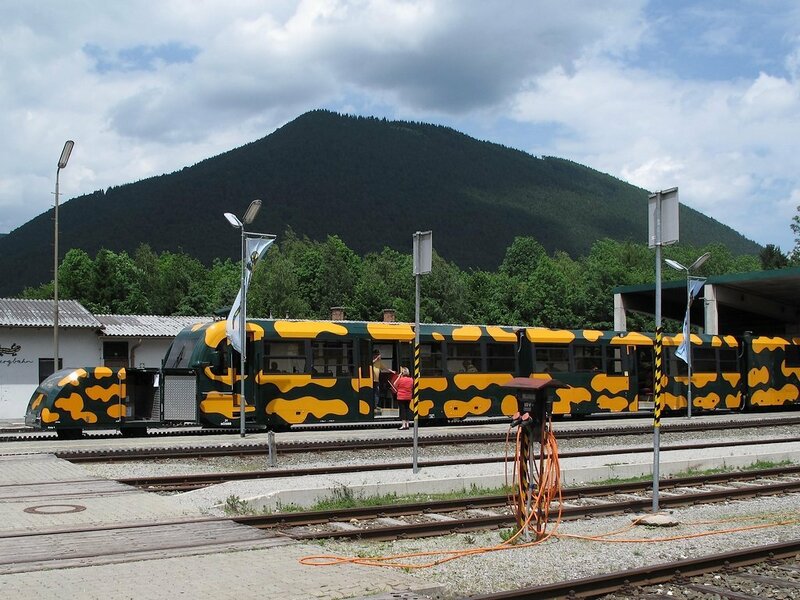 The kart (2-car, no air con but cloth seats and tidy inside) turned up on time – as soon as we’d left Nova Gorica the gripper came round with the glad tidings that we were bustituted Bohinjska Bystrica – Jesenice. Ah well, I don’t and am not going to do Slovenian track. Hope the main line’s [Jesenice-Villach] OK though. 6 minute break at Grahovo was a fag break for the train crew and a phot stop for me, so everybody was happy! The errant 813 103 appeared a bit late so we were about 6 late away, but the gripper then appeared to say the bustitution was off, so that seemed more than a fair exchange as for once I’m in no great hurry! Fantastic scenery all the way so far if you’re a fan of valley lines, with a long tunnel between Podbrdo and Bohinjska Bystrica, which has an autovlak operation of 644 021, a coach and four or five vehicle wagons. 3 late at Bohinjska Bela, the time having been all regained and then a bit lost again as we proceeded cautiously through the moleworks. It doesn’t matter though – 2 hours to kill in Jesenice as far as I know. On arrival at Jesenice I checked the yellow sheet (nearly had a fit as it has different sections for each direction and I didn’t realise at first) and 16:09 it is for Villach. So, tireless in the pursuit of decent ale I’m at Pivovarna Kazina, Jesenice, which is exactly where Google Maps says it is. Beer’s a fairly standard unfiltered lager-y thing but none the worse for that. I may just have to have another to convince myself, then it’s away for some lunch. Excellent lunch (!) at a somewhat overdone pub to the north west of the station. €6.50 for food and beer. EC210 turned up on time at 16:04 with 1216 142 – Austrian loco working south on another EC so obviously there’s no voltage problem. 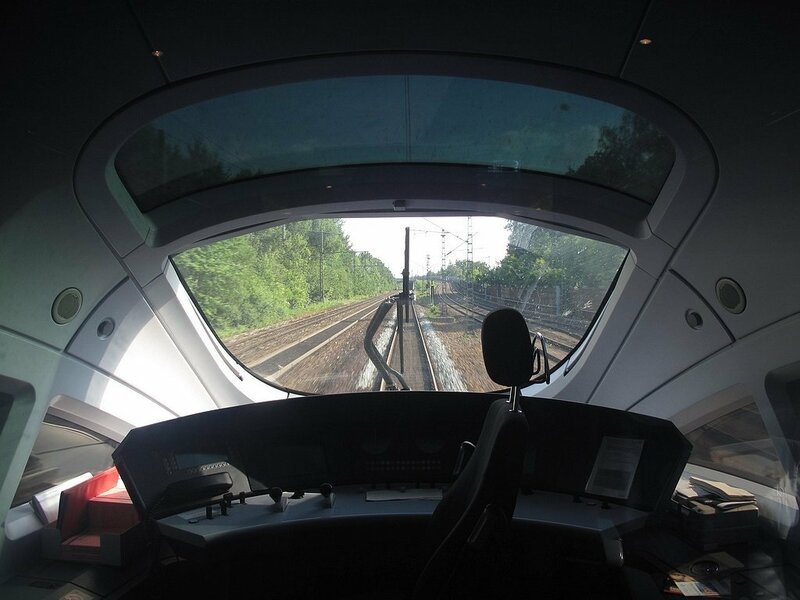 Surprise – gripped by ÖBB half way through Karawankentunnel. All legal of course, so no problem. Two astonishingly dodgy looking persons also arrived in first class immediately after the gripper had gone. Hmm ... As if all that were not enough, still in the tunnel we get a passport grip. I say again, what happened to Schengen? Into Villach Hbf only slightly delayed by an (apparent) emergency stop on my penultimate bit of ÖBB standard gauge. No harm done, and we were soon away. It remains only to get back to Wien (by ÖEC530) ready for a quick trip to Hegyeshalom tomorrow morning. The Italian loco is attached to EN237 at Tarvisio Boscoverde while the Austrian one is shunted past on the left, and the photographer struggles without a tripod! 644 021 with the autovlak train, complete with four wheeled coach. 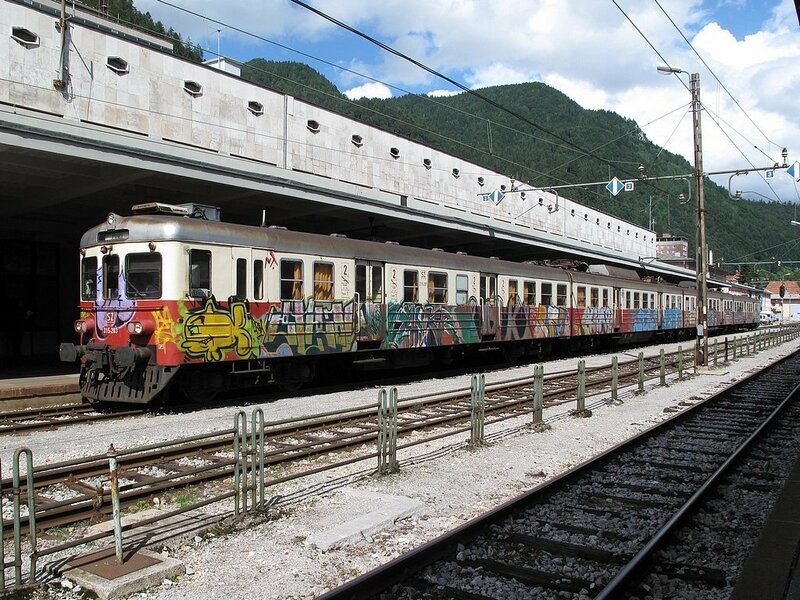 The rather plain SZ livery on this EMU at Jesenice is brightened up, even if not improved, by the graffiti. Make way back to Rennweg and straight to Meidling as it’s now too late for the REX option. Breakfast is obviously the way forward so over the road to McD’s for a bacon and egg McMuffin and a large orange juice, which to my surprise I thoroughly enjoyed. All’s well that ends well and when RJ49 finally turned up I was able to view the building site that is the future Wien Hbf, from my last bit of Austrian track. Now, about getting back from Hungary ... Railjets meet at Hegyeshalom. Eastbound 10:58-11:00, westbound 11:00-11:02 so a quick changeover was a possible in 4 minutes. Two emergency stops en route seemed to have killed that idea. On arrival at 11:00 RJ62 wasn’t there so I dived off only to find a Bzmot in the opposite platform and the crossing at the far end [should have remembered that from the previous visit and prepared myself, but nobody’s perfect]. The maddest of mad dashes ensued, with 62 now approaching ... to cut a short story even shorter I did make it and am just enjoying my second complimentary orange juice in 100 miutes, A Kit-Kat as well this time! A seemingly endless trundle from Meidling to Westbf – it’s booked 12 minutes but took longer. We’re due for 14 minutes so hopefully will go on time at 12:14. I wonder how all this will work when the new Hbf is completed and whether I’ll come back to see (probably not – there are places I like much better). On time near enough, and likewise at Linz where I decamped to go and do the Pöstlingbergbahn. This now starts from Hauptplatz where it has its own little siding – obviously track! 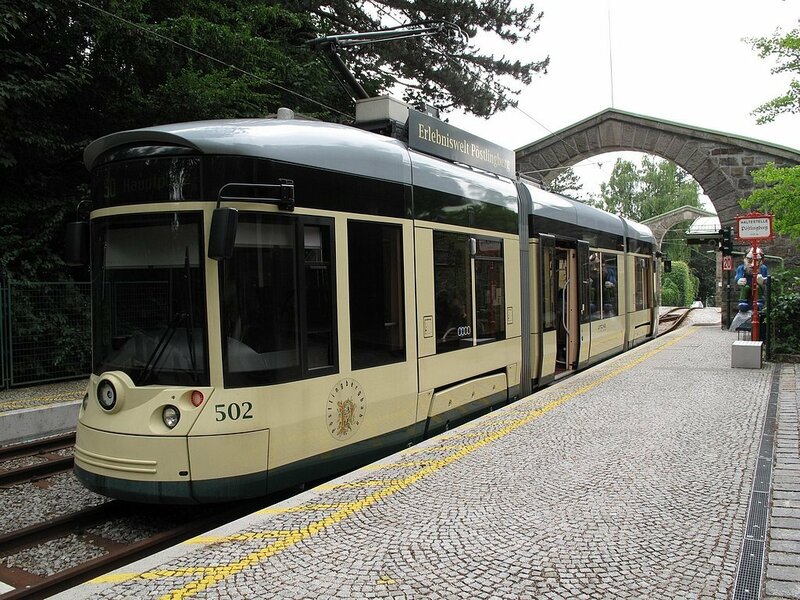 At Urfahr there is a new connection from the street tramway which crosses the Aigen-Schlägl line on the level. Interesting line with some scary gradients and a weird and wonderful terminus. I’d like to have spent some time up there but had to go straight back down with the 16:16 ICE in view. In the event I had time for a swift ‘alf (litre) at Josef, the home brew establishment. Slow but very cheery service, excellent beer (unfiltered) and really, really dreadful music. I scuttled quickly back to Hbf on the tram only to find my ICE delayed 6 minutes or so, behind a 28 late Railjet. I recall an ICE recovering a lot of time between Passau and Wels last year (15.7.10) so perhaps there’s hope. No great rush anyway. Very serious moleworks south of Schärding, to the extent of realignment for the purist. The line to Ried an Innkreis is disconnected at the junction. This delayed the ICE obviously, and we were still 5 late at Passau. On time at Plattling however and a quick check-in at the very friendly Café Pension Bel(l)agio allowed me to get the 18:28 RE back to Passau Hbf. Much good did it do me – the Löwenbräu tap has closed down and I couldn’t find the Peschl tap. I ended up at the Innstadt showpiece pub, the Bavarian Lion (again). It did however dispense a very pleasant ‘house beer’ (I bet, as usual) in an old fashioned pot mug. Passau seems to have gone very ‘café bar’ since last seen – and sadly to have gone downmarket a little. But that’s just the view of one disgruntled Brit who threw in the towel and got the 20:24 back to Plattling! Nice to have a proper civilised breakfast. Having felt a bit guilty last night when I agreed to the proposed 07:00, I arrived at 07:05 and seemed to be the last one in. The friendly attitude persisted – a pleasant place to stay and conveniently opposite the station. I really couldn’t figure out who ran the train to Špičák (Waldbahn branding, Regenthal on the side, a DB notice in the cab, classified RB) so gave up and asked the Reisezentrum man about ticket validity. He say yes, good enough for me so I piled in and went off to Železná Ruda město for (maybe) my very last 15 minutes in the Czech Republic. Very pleasant it was too – a little country station despite its name, very quiet and in good condition. I might have had a Gambo to mark the occasion had the buffet been open, even though it was 09:30, but it didn’t open until 15:30 and I hadn’t any Czech dosh anyway. Czech gripper was happy with my Interrail and Whoevertheyarebahn didn’t bother, so I’ll never know. After further careful checking of validity, elected for agilis kart to Regensburg on the bases that a) it was standing there in P1 and b) it got to Regensburg earlier than the IC. More of a baptism of fire for the gripper than for me, as she was a trainee. I’d wondered why there seemed to be a small army of staff – two trainees and a supervisor it seemed. No problem with the ticket as the supervisor obviously knew what it was. The stop at Regensburg was enlivened by buying a bottle of Bischofshof Zoigl. I hadn’t realised this style was widely available. That said, I consumed it on the way to Hof and was left wondering if it bore any resemblance to the real thing. Nice enough, but does a swing top bottle say anything about the contents? Meanwhile Alex (a.k.a Arriva) to Hof was absolutely heaving. A bit of Friday syndrome I suppose, it being 12:21. My ticket investment justified itself again, particularly when the compartment emptied at Schwandorf! Large numbers left the train there for whatever reason and I’m on my own at least as far as Marktredwitz. Being Arriva, the air con doesn’t work. Maybe the new owners will fix it. Dead on time at Hof though, and time to grab a sarnie from Yorma’s before the 14:31 RE to Chemnitz and Dresden. The scrum for this was horrendous – the gods of first class will have their way and I’ve got a forward facing seat (and being DB the air con’s working at the moment) but I dread to think what the rest of the train’s like. Trouble is, IREs are (still, I believe) valid for Länder tickets and the like. And at Plauen it seemed to get worse with a joining:leaving ratio definitely > 1. By contrast Reichenbach was almost deserted and there seemed to be a net loss. Still 4 late despite the 612 being hurled at the bendy bits with great enthusiasm. 4½ from Zwickau but all credit to the driver for 4 late arriving at Glauchau and to the station staff for 3½ leaving! The last stint to Chemnitz could be entertaining. It was, despite one hold-up, and we arrived at Chemnitz Hbf at 16:00, just 1 minute late. It then got a bit tricky. Not realising the bus times changed around this time I went off to the Reisezentrum to see if there are trains to Marienberg tomorrow (there are, apparently). Meanwhile I missed a bus by 4 minutes, giving me another 16 to wait. This at least gave me time to sort out ticketing. [Not easy with the screens almost invisible in bright sunlight]. The 612 suffered something of a drama – just before Bad Lausick we suddenly slowed down and the gripper came scampering up to the cab and made a lengthy announcement mentioning lokführer, which seemed odd. We then stopped at a signal, another similar announcement was made. Finally we ran slowly into Bad Lausick, Two pax came up to the cab and it became apparent that the announcement was basically ‘is there a doctor on board’. The drive had now completely collapsed and remained so for some minutes. He was just showing signs of coming round when the kart working the following stopper rolled up alongside at which point it became clear that the best thing for non-medical pax was to dive on to it, which I did. Hopefully the driver’s OK but I doubt he’ll be driving again. Meanwhile plans were in some confusion. It didn’t look like I’d make the planned 18:51 from Leipzig but the idea of the Kindle with all the DB timetables proved a good one. The 19:05 S-Bahn from Leipzig to Halle should do the job. And it did, totally drama free, propelled by 143 218 and on time arriving at 19:41. IC2433 was the return at 19:55 with 101 081 leading, and routed via Leipzig/Halle Flughafen which was the point of this whole exercise. I should have mentioned what a good job DB seemed to be doing with the problems with RE3746 from Chemnitz. There were several announcements on the stopper (which wasn’t even one of theirs – it was Mitteldeutsche Regiobahn, a.k.a Veolia) and when we reached Leipzig all the northbound ICs and ICEs seemed to have been held. Full marks I thought, even though my RE had been let go. [I hope they looked after their unfortunate driver as well, though I’ve no reason to suppose they didn’t]. It’ll be interesting to see what happens next – the kart to get me back to Chemnitz should be the one that was after 3746 but of course it might be short of a driver. Well, back at Leipzig we have a kart, and the air con works in this one. The previous one had failed air con which can’t have helped the driver’s situation. We also have a driver and are under way a minute or two late, passing 52 5448, 137225a/b, E04 01, E44 046 and E94 056 which are on display on platform 24 for reasons unknown. Back to Chemnitz without incident, followed by a visit to Turm Bräu which when finally located proved to be in the middle of, if not hosting, the Brauereifest im City. All a bit manic it being Friday night, and it took a while to get served, but a good solid unfiltered Hell in the end. Cracking pub, well worth a visit out of beer fest time! Taking time to locate the bus stop before the pub was a good idea, saved no end of rushing about. The Waldbahn DMU disturbs the peace at Železná Ruda mesto, working a Špicák-Plattling train. 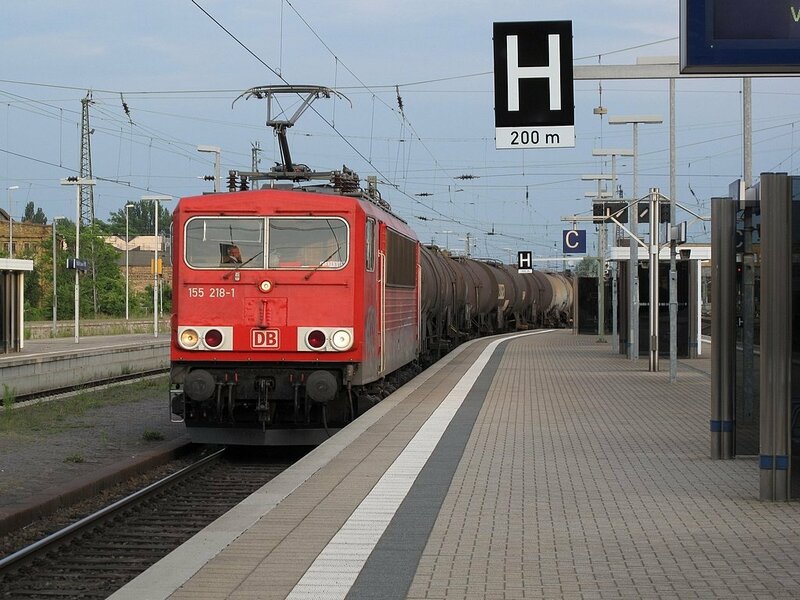 155 218 passing through Halle (Saale) Hbf with a northbound tank train. Another go at Marienberg ... lovely sunny morning, still reasonably cool and a comfortable walk up to the bus stop. Too early for hotel breakfast, fortunately an optional extra, so coffee and mayo-free baguette at the station. Fingers now suitably crossed. It worked. The kart was waiting in P3 at Pockau-Lengefeld (which I’m almost certain I used on a previous visit). 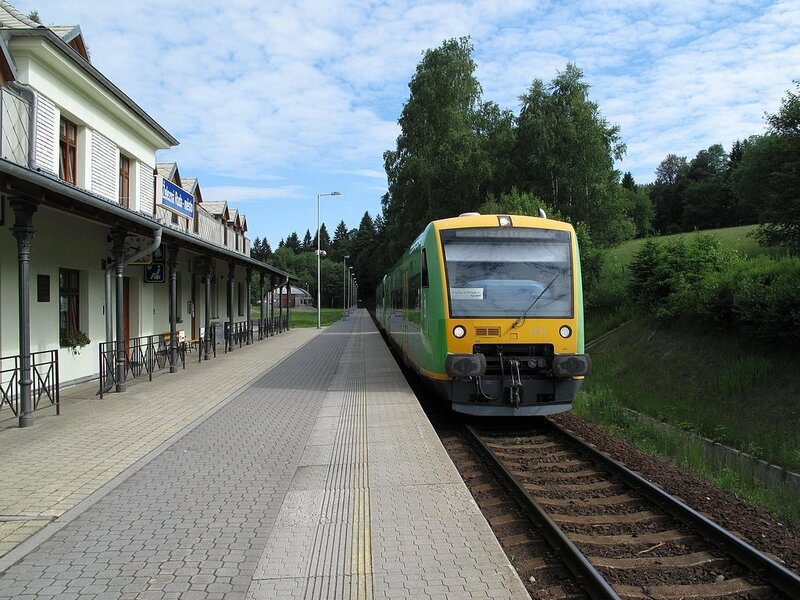 Off to Marienberg, a surprising re-opening with its one train M-F and four SSuO. Rather palatial and new looking end loading ramps at Marienberg, perhaps it’s raison d’être is military. There’s a dodgy bridge en route with a 10kph speed limit, though presumably it’s being worked on as there was SLW on the road below. A typical Sachsen branch, all trees and hills and rivers, delightful to look at on a sunny morning – but I wouldn’t bet my house on the passenger service. Other than me there was one passenger each way. Well, no, I wrote that before we picked another one up at Zöblitz-Pobershau. Back to Chemnitz a couple of minutes late, sufficient to discourage me from a dash to Point for supplies – just as well as the tilting thing for Nürnberg arrived dead on time and wedged. Once again my reckless ‘investment’ paid off and I travelled in relative comfort. The air con worked on this one too. A pretty boring run to Nürnberg. Timing slipped about a bit but we were only a couple of minutes late in the end. I could do without these long medium paced (well, they’re 160kph units and they do try) runs over track I’ve done several times already. The whole thing strikes me as like our own much loved (!) XC. Tilting karts with underfloor engines in every vehicle. Formations too short for the traffic they carry (this one was 2x2). Insufficient luggage space. Cramped by the tilting profile. And so on. Nürnberg Hbf was completely manic, Think Birmingham New Street on a bank holiday weekend (which this is) and expand it. I nipped off to the Ibis which,it has to be said, is very handy being not much more than 100 metres away. Scruffy too, but with the two night weekend rate not ridiculously expensive. Back to the station where for the sake of a 3 minute later arrival ICE1604 seemed a better bet than an S-Bahn to Bamberg. I’m on it now, my plutocrat neighbours visibly shocked by the scruffy git with T-shirt and ice cream and waiting for the gripper to come and banish him to steerage. Ah well, never mind, Mr O’Crat. So to Bamberg again. Never seen it in summer – what a wonderful town. Commenced at Schlenkerla which frankly, lives on its reputation. World class pub, unique (and very good) beer, surly service. Sorry, but it won’t do. I’m not that scruffy, nor was I the only one to get the surly service. Thence to Ambräusianum next door but one. Magnificent beers – had hell and weizen, and (which goes to show) was given a sampler of the dunkel. All to die for. Kind of Wallonian, which may be the appeal. Called in at Fässla on the way back to the station and couldn’t fault that either. My case for Bamberg rests. Forchheim looked, er, poor at first sight. Eichhorn tap was closed, and Hebendanz was showing no evidence of life either. [Both alive and well as far as I know, I just picked the wrong day]. On the other hand Josef Greif of Forchheim seemed to be a new discovery. I called at a café-bar-ish place (Blaue Glocke) in the hope of getting some Greif, as opposed to grief. There was none of either, but they had a very presentable dunkel from Brauerei Först of Drügendorf so it was far from a wasted effort. Generous free sample too (again). Finally to the Neder tap, another treasure. A proper four-ale bar [intended as a compliment!] with the draught pils at €1.80 the half litre, in a pot mug to boot. A pub to treasure, and I hope they do! I left Forchheim thoroughly pleased with my visit and returned to Nürnberg for an early night, on an RE at 20:49. The end of the line at Marienberg. Note the two new loading ramps. Alarming proliferation of short term moleworks notices this morning – tomorrow’s schedule to be checked carefully when I’m in a suitable place. ICE684 is unscathed so far and away to Würzburg a minute or so late. 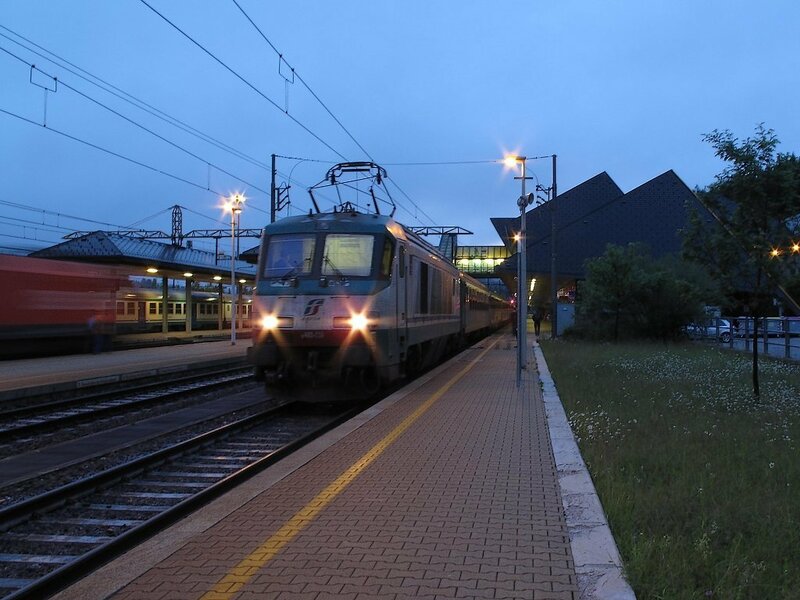 No such lateness at Würzburg – I was in my seat on the connecting train, at a different platform, by the booked arrival time of the ICE. The onward train was a new five car push-pull set, rough riding and uncomfortable. Not one of their better efforts. I wonder why Gemünden station is a mile from the town, given that the railway passes by the end of the main street! No matter, it was not a bad walk to a suitably picturesque altstadt with square (actually triangular), trees, tables outside (shut at 08:15 on a Sunday) pubs, etc. 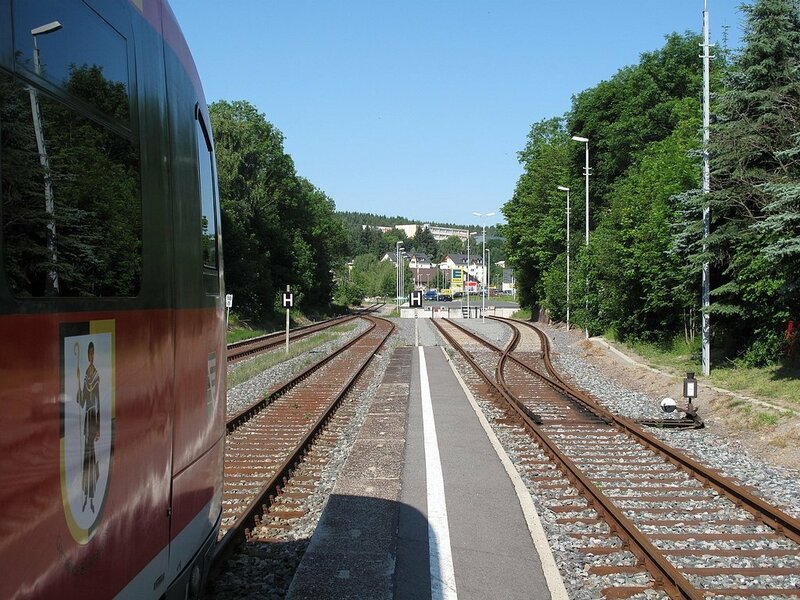 The bike train turned up with a modern push pull set – didn’t really look the part but sure enough it set off towards Würzburg then lurched satisfactorily to the left on to the freight line, which parallels the Würzburg line as far as Wernfeld. [I needn’t have worried on the cyclists’ behalf as there was also a vehicle reminiscent of a BR brake second attached at the rear of the train, which I didn’t see when it arrived at Gemünden]. There’s a crossover west of Waigolshausen which physically at least would allow access to the eastbound main line. Perhaps it’s not a signalled move, as we stayed on the goods line through the station (‘wrong line’ effectively), crossing over east thereof. Large crowds at Schweinfurt - some sort of trad-fest going on today with vast amounts of lederhosen (and a fair amount of beer) to be seen. It has to be said that the lace and embroidery suited some of the young ladies very well though! The Schweinfurt-Nürnberg train being absolutely wedged, my ticket ‘investment’ proved its worth yet again. Wrong – the gripper stood guard until they all piled out which I think was at Erlangen. The train was about 6 late at one point but only 3 at Nürnberg. On to IC200 to Aalen and ... travel survey!! First one for ages and ironic that it should be on the last (maybe) big bash. [For quite a few years it seemed I could barely put my nose outside the UK without getting travel surveyed, although it hasn’t happened much of late. The surveyor was a very cheery bloke but had real, real difficulty fitting my day’s travel into his neat little form!] Dropped time steadily and arrived just after the Ulm connection should have left. It was held, this not being the UK, and ran 2 minutes late throughout. Just at the top of the steps at Ulm Hbf is the trusty Upper Crust, and one of their large mayo-free baguettes provided breakfast (rather belatedly) and lunch. I then discovered an IRE to Aulendorf which runs a few minutes in front of the planned IC so I got that in preference. My haulage on the IC, which I photted instead, would have been a pair of Rabbits but I fear today’s re-engined versions just don’t have the same (or any, really) noise appeal. Excellent trip to Bad Wurzach (seasonal, odd Sundays/holidays only) where there’s a large glassworks to keep the line open for freight. No buildings on the station platform but it looks newly resurfaced, as does the pathway leading to it. No grippage, just a local authority man handing out leaflets highlighting the area’s attractions (which include a former peat railway). Return to Ulm was Rabbit propelled and just a minute late. Seeing the 15 minute delay to my proposed 18:55 to Augsburg (11 minute connection thereat) I took fright and decided to abandon the intended visit to Barfußer and head straight back to Nürnberg via Aalen. I’ve also rather taken fright about tomorrow’s plan for Pfullendorf, might head out to Prien instead for the Chiemseebahn. I really can’t be missing my flight home, travel insurance or not. A Rabbit-powered RE pauses at Aulendorf en rout to Lindau. 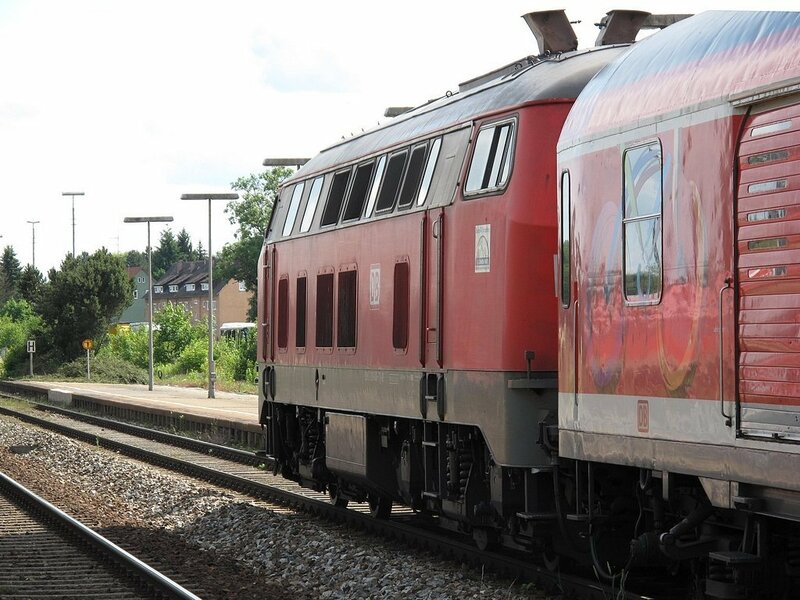 A 628 stands at Bad Wurzach with one of the seasonal Sunday/holiday trains from Aulendorf. Without incident, and in comfort, to München Hbf where moles were on the rampage again. No S-Bahn through the city ... help ... how do I get to the airport. Established eventually that S1 was actually running but from ‘upstairs’, and picked up assorted info from the Reisezentrum including the moleworks booklet. I settled on EC85 (going to Bologna) as far as Rosenheim then RE to Prien am Chiemsee for the Chiemseebahn tramway. When the EC stopped at München Ost, S-Bahns were rife and it occurred to me that the S8 might be running from there, First attempt at the moleworks booklet suggested they probably were, second one brought the realisation that they were running through from Pasing via München Süd and would do the route I needed from München Süd to Pasing. So to Prien and the tram which sadly is a modern fake, just a steam outline replica. Should have done my homework but worthwhile track at modest cost anyway, and both line and passenger stock are genuine even if the motive power isn’t. Not a ghost of a pub in Prien so I retired to Bad Endorf and an Augustiner pub (Gasthof Weissbräu I think it was) which also dispensed a gigantic schnitzel at modest cost, and Schalchner Weisse which was a new one for me. All very enjoyable. On return to the station there was no sign of the preservationists but enquiry in the shop revealed that they were running and would be leaving ‘in 10 minutes’. They turned up a couple of minutes later in a splendid single car diesel unit with wooden seats, in need of a little external TLC. It went OK though and an excellent trip was had to Obing and back, well worth stopping off and waiting for. It’s mainly flat and roadside at first but soon becomes more scenic with wodded stretches and some long gradients. 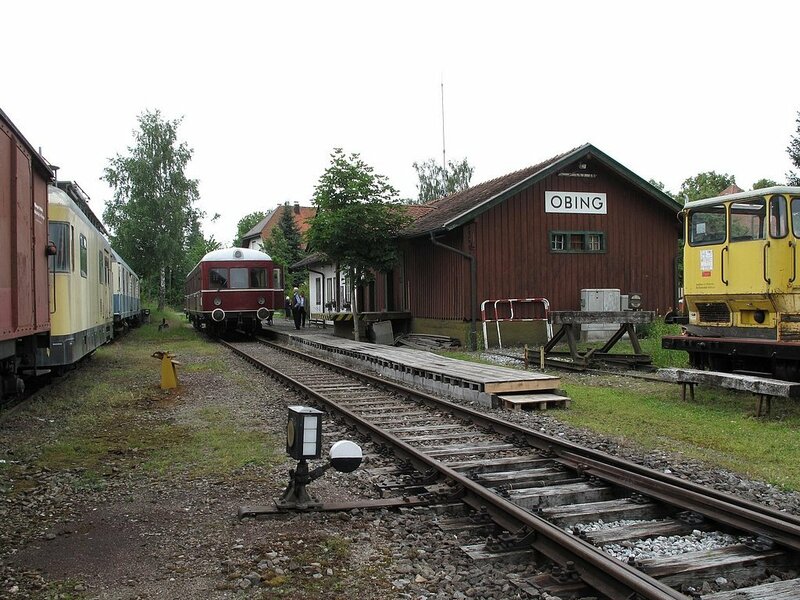 Obing itself appears always to have been the terminus. No refreshments, shop or anything, just a simple out and back – just what’s required for a passing track-basher. On to late-running RE79032 for the trip back to München Ost, Certainly to Pasing to do the diversion, and thence to the airport, route to be determined by the time. That’s the plan, anyway. Usual stuff then – queue for security, queue for passport. Passport and security blokes were both very cheery which makes a nice change. From there to the duty free for a top up on the gin stocks then home via a very punctual Embraer, reasonably quick immigration and baggage at BHX, two trains to Wolvo and then a non-existent (according to the departure sheet) 00:02 to Shifnal where Herself collected a very weary traveller. 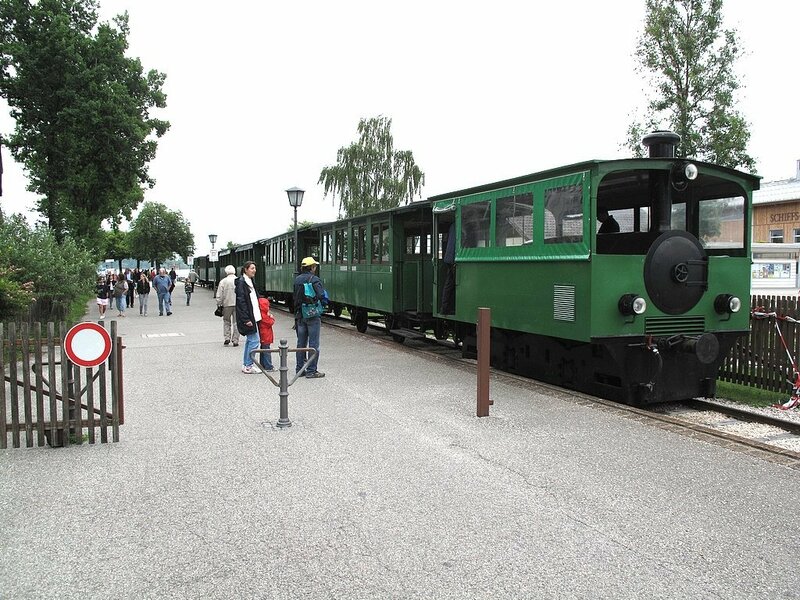 Sadly, the "steam tram loco" seen here at Prien-Stock Hafen on the Chiemseebahn is in fact a diesel. I never did get to Longueville. But I did do another trip to Germany in 2011, prompted by news of steam workings on the Schongau-Landsberg line (I'd done both ends but not the middle). And I did use a low-cost(ish) airline but not That One, so in line with plan A!